The KISS rule (Keep it stupid and simple) applies over here. Making things simpler is more difficult. Implementing this principle will reduce the work to the bare minimum and lets the team focus on the simplest possible solution for creating the same business value. The team members need to ask themselves with everything they do “is this really necessary?”. It’s a new way of thinking which kills over-doing of everything and helps the team to keep the things and process simple. The main advantages of simplification are speed and reduced complexity. You can delivery business value faster and the delivered product is less complex. This principle applies to processes and communications as well. What is the Product Backlog? The Product Backlog is simply a list of all the stuff that the business would like their product to do. It is the development teams single source of requirements and as such sets the scope of the development. If it is not on the Product Backlog it does not get done! Apart from the product itself the product backlog is the single most valuable artefact of the development and as such is owned by the trusted representative of the sponsor and wider business community, the Product Owner. The content of the backlog may include brand new functionality, enhancements to existing functionality, under the cover quality improvements (code re-factoring), investigative work, defect fixes, etc., in fact anything and everything that needs to be done, all written in straightforward business terms. Why do we need to manage it? As more and more larger organizations look to Agile as a means of delivering software to their customers the one thing that keeps coming back to me is that for any of this to work there has to be transparency and acceptance that a move to Agile will change your organization, not understanding this will court almost inevitable failure. Agile in itself is an aspirational desire to change the way that we deliver software, one that does away with the project processes that evolved over the years from Waterfall. I know that waterfall feels sound and safe with all of its up front business analysis, project planning, Steering Committees and that all important Change Management process, but in reality it really is more of a facade than foundation. Learn how to build a secure VPN with security and failover between multiple VPCs using Openswan as a software-based VPN solution. Today, we will be going through how to set up a full-mesh topology (where every region has its own unique connection to all other regions). Openswan is a great choice because first of all it is free to use, and it is quite versatile for different use cases. Also, if you haven’t had a chance to familiarize yourself with Amazon Web Services (AWS) and VPC, I would highly recommend reading up on it. You may be surprised what it can offer your company! After creating an a Elasticache instance for Redis and loading it with data dynamically, it became apparent that it would be useful to warm the cache with a large dataset to further improve performance. Redis recommends using their Luke protocol to accomplish this by creating a text file with the data and then use the redis-cli to import that into Redis directly. This approach is significantly faster than doing it programmatically. Here I’ll elaborate on the steps I took to do that. You’ve a Master Form containing multiple child forms. Issue is, child forms are submittable on their own. But master form can only be submitted if all inner forms are valid and submitted. Again, we’ve all separate services for childforms and master form – Meaning, child forms 1,2 & 3 have api1, api2 and api3 as services (say). Master has api-master which can’t accept submissions from child forms but it is dependent on their successful submission as the backend requires data from all of them. 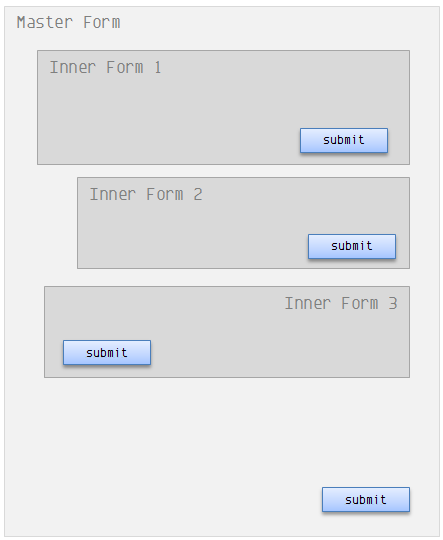 A formcan contain only one actionpath and therefore nested forms are not possible in HTML. The only way (that I can think of and) I believe to be efficient is submitting via Ajax.